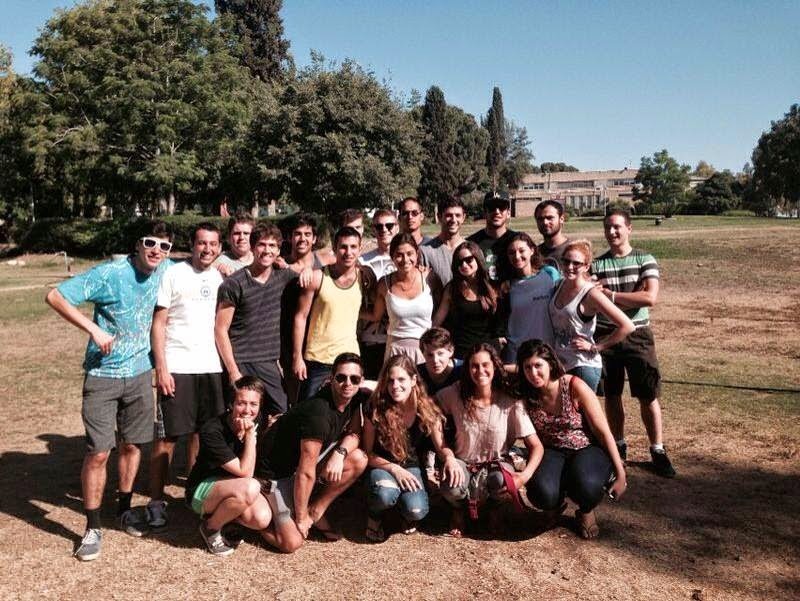 This blog will touch on a number of things ... whats happened in my life a month since my Aliyah, the final seminar for Garin Tzabar which I just attended this weekend and the sad news of three missing Israeli teenagers and my thoughts on it. So, now over a month on since I became an 'offical' Israeli Citizen, honestly, not much has changed. I managed to get a job at a local frozen yoghurt/ice cream place called Anita which I will be doing till August when I will join my Garin in Raanana. Anita has 3 branches in Neve Tzedek and one directly opposite my house in Florentine... pretty convenient. The shifts are fairly long but I enjoy working there as it keeps me busy and the people are friendly. Again, in true Israeli fashion, I have been invited for Shabbat dinners by a number of the workers and Anita herself! One of the biggest changes I have noticed in myself is since working here and using my Hebrew on a daily basis, I am far less embarrassed to talk and make mistakes whilst speaking which has meant my Hebrew has come on leaps and bounds. Weirdly, I now find myself thinking and counting in Hebrew so its clear some sort of transition is happening. Day to day work as always can be fairly monotonous but one day at work really touched me and I hope the sentiments of it will stay with me forever. Having just served a number of soldiers from the Iron Dome unit their yoghurts (one of whom was a girl from America and a participant of Garin Tzabar), I proceeded to serve an American tourist who offered to pay for all of the soldiers yoghurts. Having told him that they have all already payed he refused to accept it and proceeded to pay them all back for their food and asked me if soldiers come in often as he wanted to leave a large sum of money behind the till to deduct whenever a soldier wants anything. Quite honestly at this moment I was really moved and touched by the genuine, kind and heartfelt gesture of this tourist who felt that paying for all these soldiers was the best way he could give back and show his gratitude. It helped me see first hand how much people really appreciate the guys and girls on the ground that work day and night ensuring everyone's safety (something even more evident with the current situation which I will touch upon later). Whilst at the moment money is hard to come by, I know I will do my best to try and help a soldier in what ever way I can. And when money hopefully isn't as tight I hope I will do the same as this tourist, as I could see how touched these soldiers were and its moments like that which I am sure make the hard and lonely nights more than worth it. Another night at work I met a family from England who moved to Israel a number of years ago, one of their sons did Garin Tzabar, after talking for a while and explaining the new system and that I will be living in Raanana, they told me that they too live in Raanana and would love to have me round for dinner or should I ever need help, support or food to just let them know. The hospitality out here and growing understanding of the issues lone soldiers can face is really evident and people really do want to help. One last anecdote from work and I promise ill move on! The other night I had the pleasure of meeting an amazing guy from England, he came into the shop with his wife and friend and was incredibly funny and outgoing. When I took my break they still happened to be sitting outside and so he engaged me in conversation asking what I am doing here, after explaining i'm joining Garin Tzabar he told me about his sister who just so happens to be doing Garin Tzabar at the same time as me but is on the European Garin with a number of my friends. After a number of jokes and a pretty hysterical conversation (was nice to be around some English banter) I added his sister, Emma Myers, and since, we have been speaking a fair amount and discussing our journeys, dreams and wishes for the army. She has tough competition for my friendship as her brother is pretty awesome although she seems great as well and I am looking forward to meeting her soon. Garin Tzabar really is a framework that brings people together and I look forward to meeting her along with her friends on the garin and my current friends who are in it. The prospect of meeting so many new people all doing the same thing as me from all over the world is incredibly exciting and special. This story leads me perfectly onto summing up the last seminar in the preparation stage of Garin Tzabar. I honestly cannot believe that I have finished the last stage of the preparation process of Garin Tzabar. All that is left is the absorption period which is from August 13th-November which is most likely when I will draft. Things are really steamrolling ahead and I am really excited for whats to come. More new people joined onto our garin and have fit into the mold perfectly! Our garin is continuing to go from strength to strength and I cannot wait to make the big move and begin living with my new family. This seminar was perhaps the most important of all of them as we underwent an interview by a member of Garin Tzabar and an officer from the army. I entered my interview much more relaxed then I thought would be, all thanks to my improved confidence in speaking Hebrew. I was asked a number of questions relating to my family, myself, my reasons for wanting to join the army, medical conditions and so on and so forth. I was very happy with how the interview went, I was able to conduct it entirely in Hebrew and express myself easily and coherently. The seminar itself focused on providing us with more information relating to the absorption stage of the process. We were introduced to Raanana a bit more and how it would work. The time and effort into ensuring our garin is comfortable in Raanana is really impressive, a number of shops have already offered to give us discounts, including local bowling alleys, shopping centers and so on. It seems like the residents and the mayor, who left us a perosnalised message, are really excited to be hosting us and are undertaking a number of initiatives to welcome us and ensure our time will be as trouble free as possible! Like all previous seminars, a lot of emphasis was put on team work, and building the garin. On Friday night we had an activity which forced us to take a step back and reflect on everything. We entered a candle lit room with chilled out Israeli music. Around the room there were a number of thought provoking questions for example, what do we want to leave behind before coming to Raanana, what is our biggest fear about the army etc. After going round the room and writing down our answers we then had to sit down and write a letter to our selves which we will receive on our draft date and a letter to the garin. Thinking about how I will be on my draft day was fairly intense ... I always think about being a soldier and being in the army but never about that moment where it becomes real, where I go to Tel Hashomer, hand in my civilian clothes, receive my army uniform, board a bus and start my army life. Being in a situation which forced me to reflect on this scenario really hit home. Every seminar and every activity during them is planned so meticulously and its obvious why each activity is done and why they do it when they do it and how they do it. 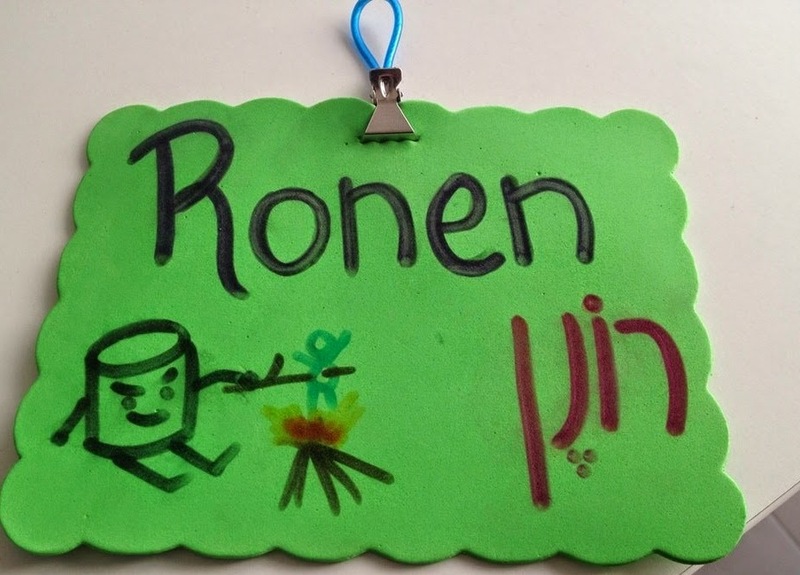 A further ulpan test was given which would determine whether we would need to go to the intensive 6 week ulpan course, we found out if we will in the coming days. This seminar also had a lot more free time than normal which allowed us to all get to know each other in a more relaxed and informal way rather than planned activities. The end of the seminar had us all reflecting on the journey we have already come on and the journey which we will continue to undertake both individually and as part of a garin. Our leaders for this part of the process said there farewells and let us know that should we need anyone to speak to regarding anything that they would be there to help and I truly believe that. They made us room tags to hang on our doors and a number of other things for us to use as a garin. The job they have done and the effort they have put into running our seminars is greatly appreciated by everyone as without them the Garin would not be as close as it is. My room name tag with the infamous marshmellow! My Garin (minus a few) and our leaders ... my new family. Im on the front row 2nd from the left. It is safe to say the Marshmellow Garin is only going to go from strength to strength and I am really excited to see what the future holds! I am ready for the next step and am excited its just around the corner! Unfortunately I have to change the tone of this blog post now as I want to speak about the recent kidnappings of three Israeli teenagers. On Thursday night three teenage yeshiva students were making their way home from Yeshiva for shabbat. Attempting to hitchhike home they ended up being kidnapped, most likely by Hamas. This terrible news hits home even more today given that it is Fathers Day. The parents of these innocent children are suffering so much right now not knowing the whereabouts of their children and so we should all spare a thought both for the children, their parents and family. It is times like this that you see more than ever how the population of Israel is one big family, people are saying extra tehilim and are meeting at the Kotel in their thousands to pray for their safe and speedy release and everyone is rallying behind the army, police, intelligence forces and the families themselves in support. It is amazing to see and I pray that we find them soon, safe and sound and that the terrorists who committed such a terrible crime are apprehended. What shocks and saddens me even further about this whole situation is that Palestianians are celebrating in the streets and handing out sweets whilst calling for war in order to stop the IDF finding these children, a truly terrifying and disgusting prospect that people celebrate such a disgusting act. This to me is a true insight into the war we are fighting and the type of people that Israel attempts to negotiate with on a daily basis to no avail. Of course so far the English medias coverage of this situation has been fairly thin but I am sure in the scenario where the IDF has to carry out any attacks it will be quickly reported and distorted. To help, spread the news, let people know about these 3 innocent teenagers before the world hears a different story, tweet using the #BringBackOurBoys or #BBOB, make facebook status' and talk to people. It helps! Its times like these and times where attacks are occurring all around Europe which just ignite my passion to go into the army and protect the Jewish people. We need Israel and Israel needs us to support it, defend it and if necessary fight for it. AM YISRAEL CHAI. Wishing you all a good week and praying for their safe return.